Eduard have sent us the expected release schedule for April and we have lots of pictures and a full list of what is to be expected – check them out..
MasterBox have sent us the three newest of their March releases so we can pour over the contents – the German housebreakers got a going over the other day – now it is time to scrutinize these four young US marines in the MasterBox kit MB3589: U.S. Marines in Jungle – straight to the point as title suggests - let's get straight on to the kit. Dragon have sent us pictures of an April release - their version of the tank hunting 1/35 Sd.Kfz.167 StuG.IV Late Production - Smart Kit. Full of slide mould technology and newly-tooled tricks - lets look at the kit in preview..
Mantis Dogs the opposition with their "bitchin" new releases - ohhh & some Cossacks too! Mantis Miniatures have sent us some great new images of their latest figures and we give you some insight to the great painter who has brought these gems to life! From Kagero we have the second part of their history of the P-47D units of the “mighty eighth” called “Thunderbolts of the US Army air Force” This book chronicles the operations of this rugged aircraft from March 1944 - May 1945. 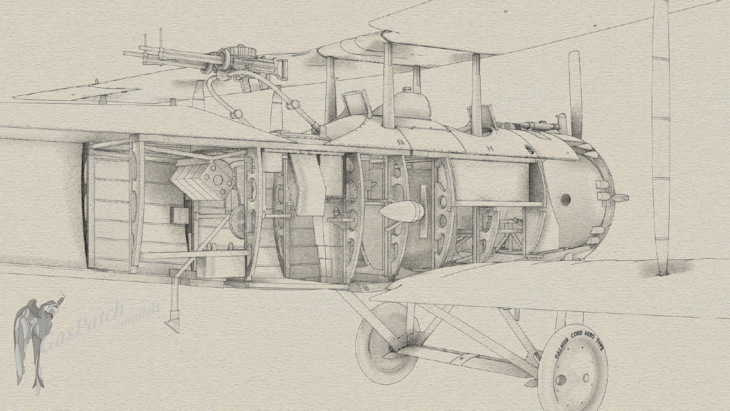 It is full of great pictures and pilots accounts of the kill or be killed air battles in the last months of the war – click on below to see what we found out about the book when we read it…. MasterBox has three releases for us this month, some US Marines in the Pacific, A troupe of Germans in the biting cold and this kit – MB 3584 German Infantry - Western Europe 1944-1945 Which sees four late war German soldiers ready to do a co-ordinated search of a house. We will look at the quality of the kit and show you pictures and the four troopers and give our opinions of the results. Sunday - time for a trip down a quiet country road ? 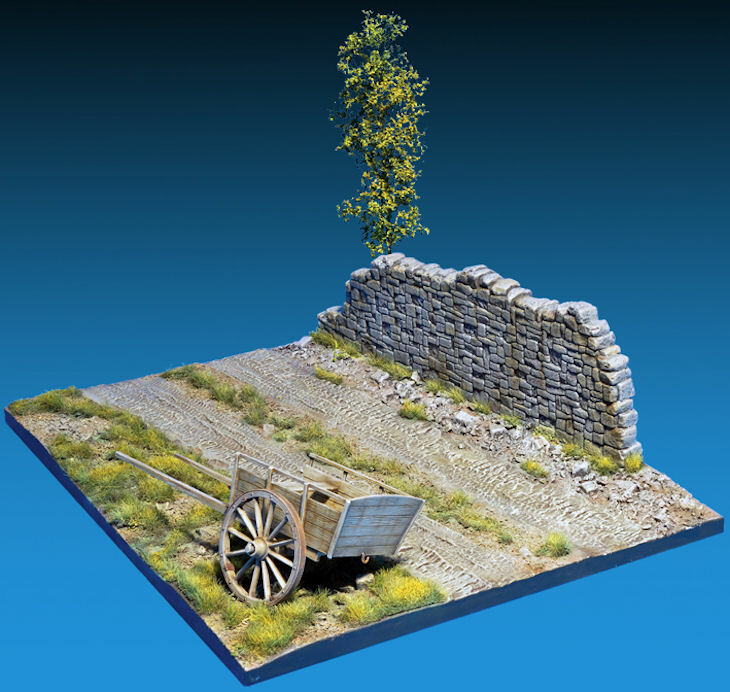 To add to their other recent additions of kits MiniArt adds a new kit of a country Road Diorama for your model placement needs - let's look closer.. 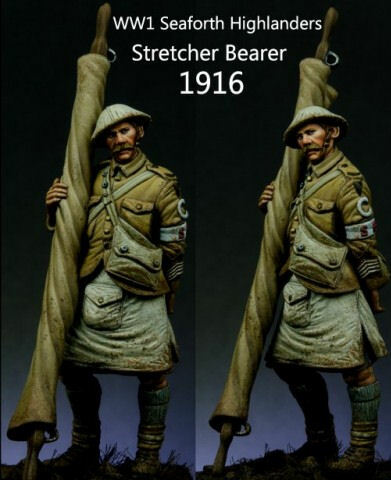 Figure maker Carl Reid has sent us pictures of the prototype and the built and painted up figure of his WWI stretcher bearer in resin that has just gone on sale - click the link below for a closer look at this lovely figure.. Some interesting news for all Revell (and model) fans..
More new releases "cobbled" together from J's work. 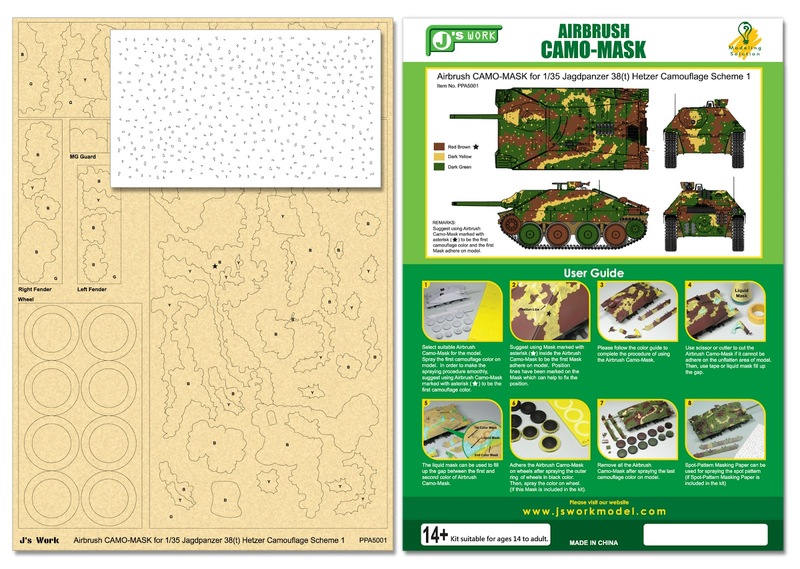 After the announcement (below this post) about the Kabuki style masks for the Hetzer tank we have these - more Do-It-Yourself groundwork debris from the Asian manufacturer of diorama equipment J's Work. 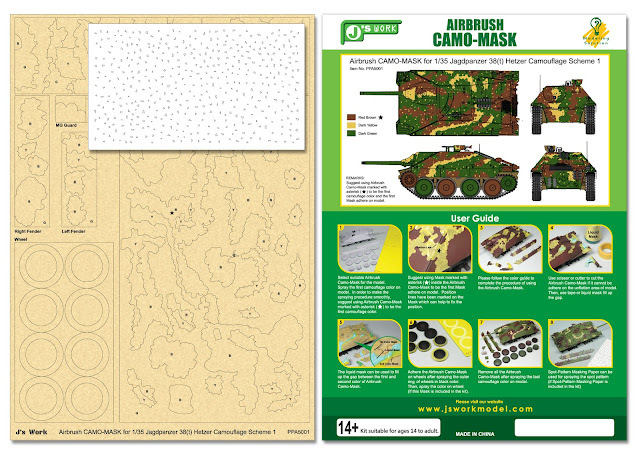 J's Work - More new products keep coming..
Today we have more details of new products coming from J's Work in the far east.The first thing we want to show you is the latest set of Kabuki-style masks for your Hetzer tank in 1/35th scale. This is one for the birds - a sheet of photo etched coloured brass that is trying to replicate birds and other fauna in 1/35th scale from Eduard. When Mig Jiménez released the first book in this series it soon became a best seller number one and a vital tool to not just Military modelling fans but all genres of model making. It became a constant companion to many modellers and a handy thing to have near the modelling bench. L.Z. Models have released details of an excellent new truck - the CMP Ford F15 with open Cab in 1/35th scale. 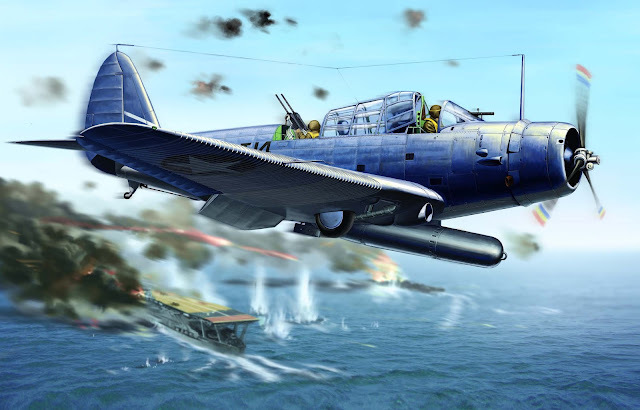 With some pretty broad possibilites for swapping and updating the cargo compartment you can add Breda guns and even a flak 20mm (which we are told is coming very soon as a kit from LZ in itself) - Lets have a look at the information you need to know about this new kit..
BarracudaCals Have finally fessed up with the news on their excellent 1/32 scale add-ons to turn your already darn good kit of a P-51D Mustang into a show stopper. With all of the new Mustang kits on the market (and the fact that these can all be adapted to fit them if need be) and the undeniable popularity of this aircraft these are set to be a big seller! Also there are the latest in P-51 decals, cockpit placards and even a book on the thunderbolt! I will pass you onto Roy from BarracudaCals now to show you the good gear they have coming on sale. 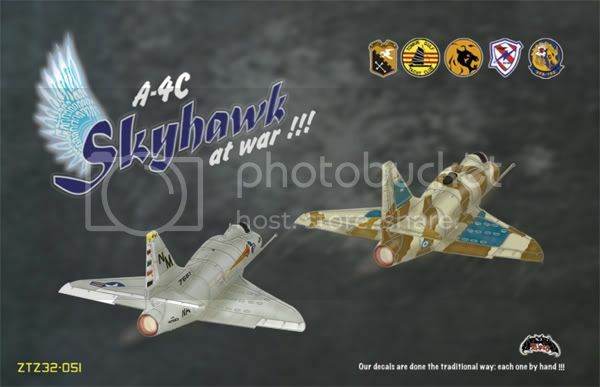 AMS/Zotz new A-4C Skyhawk Conversion and decals strike! We have the latest images from AMS Resin and Zotz of their latest collaboration, a conversion for the Trumpeter A-4E or F kit to turn the model into an either US Navy or an Argentinian A-4C light fighter bomber. This set contains also a great set of decals which cover three US Navy birds and two Argentinian aircraft from the 1982 Falklands War. ICM Holding has releases some more pictures of their Krupp L3H163 truck in 1/35th scale. So we thought it was time to show you now there are basic test shot built up pictures..
To add to their "WingTech Series" Cyberhobby have released details of the March release tooling of the famous terror of the Japanese fleet in WWII the SB2C-4 Helldiver in 1/72nd scale. Eduard releases exact details, sprue shots and the price of their new 1/48th Emil..
IPMS Germany has released the first lot of pictures of the 2012 Nuremberg Toy Festival that is being held this week - some very interesting news to be gleaned from the pictures - here is the link for the site - If you look carefully at the pictures you will see many new releases and surprises ready to delight us. 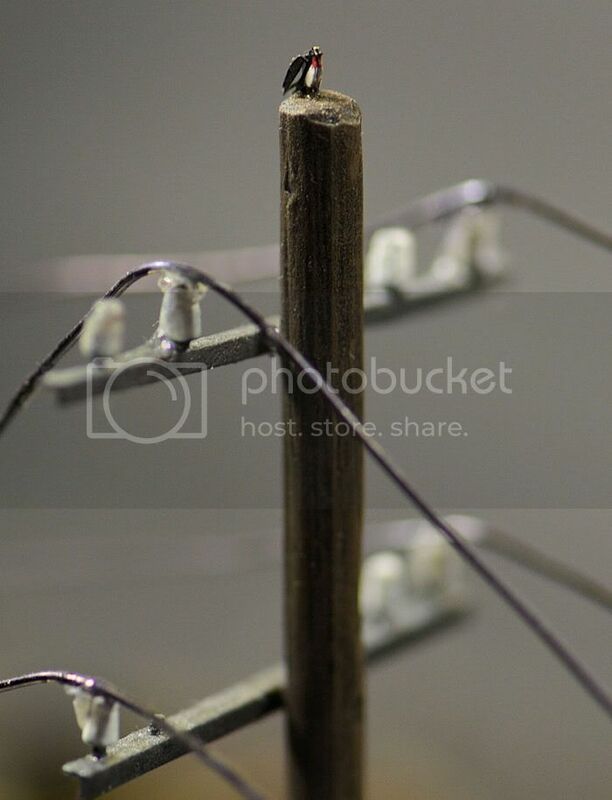 It is nearly as interesting to see the background stuff as what is in the frame - Enjoy dissecting the shots! Round 2 has some excellent news articles about the new car ranges from AMT and just what goes into developing them. They also have an interesting article about the work they did restoring and re-vamping the classic Hulk kit box art and the latest on their new pre-built kits of none other than the Beatles from the Yellow Submarine period - read on below for the news and then on to their site for the whole story..